France is doing a great job annoying pretty much everyone in Brussels these days — lending support to a Libyan warlord, fussing over the start of trade talks with the U.S. and boycotting a long Brexit extension. President Emmanuel Macron, whose election victory march was to the tune of the EU anthem, Beethoven’s Ode to Joy, finds himself isolated or often in the minority. Granted, he has extracted concessions, like shortening the Brexit delay or more reassurances on transatlantic talks. But it’s doubtful these successes resonate enough at home to matter in next month’s European elections, in which case political capital will have been spent for nothing and the victories will prove Pyrrhic. U.S. Trade | EU agriculture ministers are expected to rubber stamp next week a plan to start trade talks with the U.S. aimed at keeping American automotive tariffs at bay. That’s following a green light yesterday from envoys of the bloc’s 28 nations. France says it’s still opposed to the talks since they come under a cloud of tariff threats and because the U.S. has opted out of the Paris Climate Accord. Combusted Germany | The German car industry may be facing far more existential issues than tariffs. For the country’s biggest employer, the transition from the combustion engine to electric is already proving painful and expensive. Week Ahead | EU member states are set to approve the bloc's new copyright rules, clearing the final hurdle for the controversial legislation to enter into force. When implemented, Google and Facebook will have to either pay for or remove songs and videos that users upload to their sites. Soft Brexit | Theresa May hinted she’s working on a compromise with her domestic political enemies on a possible post-Brexit customs alliance with the EU — a move that would put Britain on course for a soft divorce. May’s relying on talks with Labour to find a Brexit accord that can secure a majority in the House, enabling the U.K. to leave the bloc by May 22. Merger Concerns | A tie-up between Deutsche Bank and Commerzbank faces intense skepticism from top European regulators, amid worry that the ECB’s credibility will suffer a blow if a future merged bank runs into trouble. The deal might prove to be the biggest test for the ECB’s supervisory arm since it began overseeing lenders less than five years ago. Apple Probe | Apple faces a Dutch antitrust probe into whether it favors its own apps over rivals, weeks after Spotify asked the EU to investigate the phone maker. The probe adds to growing backlash against the tolls Apple and Google charge developers using their app stores and their control of the online ecosystem. Romanian Troubles | Romania’s governing party received a rebuke before next month’s European Parliament elections. Relations with the Party of European Socialists were frozen over concerns about democratic standards. Alexa’s Listening | Concerned someone could be listening to what you say to your Amazon Echo? Well, sometimes they are. Thousands of Amazon employees around the world transcribe and annotate Alexa users’ voice recordings, working to help it respond to commands. And it can get a little awkward. Great Vintage | Here’s some good news for drinkers among you: World wine production rebounded in 2018 to the highest in 15 years, after a horrible year in 2017. Italy kept its spot as the world’s biggest producer. Spanish bonds are making the most out of the fear surrounding economic stagnation. 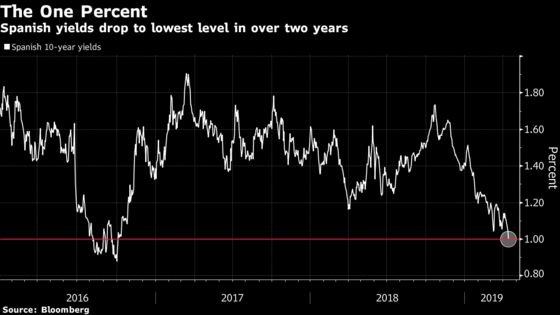 Ten-year yields dropped below 1 percent for the first time since 2016, while those on five-year bonds were the latest securities in the euro area to drop below zero percent. The rally comes after a dovish-sounding ECB once again gave investors the green light to hold riskier assets.